This month, OneNet marks the five-year anniversary of the Oklahoma Community Anchor Network (OCAN). OCAN is a system of high-speed fiber optic cable that spans 1,005 miles and connects 35 Oklahoma counties. The network was designed to bring high-speed broadband options to rural communities across Oklahoma. 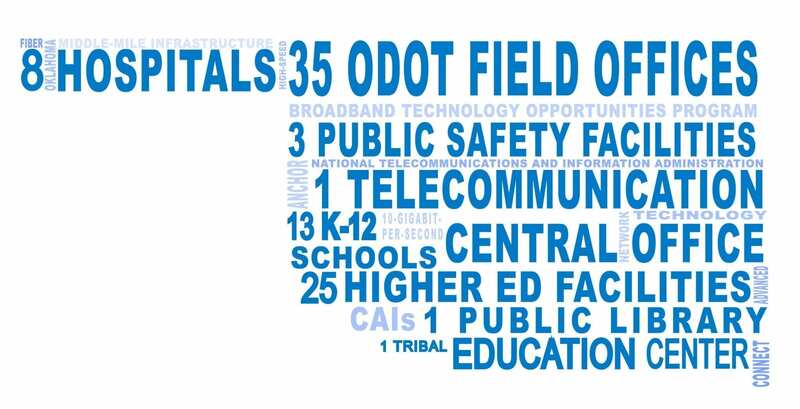 OCAN originally connected 33 community anchors, including higher education institutions, career technology centers, libraries, public safety departments and health care providers. Over the past five years, that number has more than doubled: the network now includes 87 community anchors. OCAN is a middle-mile network. This means the network provides broadband services between its anchor institutions, but not directly to users’ homes or businesses—traditional telecommunications providers provide this “last-mile” broadband service. This has allowed OneNet to take part in several private-public partnerships to enhance economic development across the state. Because Oklahoma’s colleges and universities are an integral part of their communities, most OCAN anchors are institutes of higher learning. However, OCAN’s broadband services provide opportunities to far more than just those. The Chickasaw Nation Medical Center in Ada, a state-of-the-art facility constructed in 2010, is directly connected to OCAN and its fiber broadband network. This allows the hospital to access patient data quickly and securely without compromising its network capability. OneNet and Chickasaw Nation Telecom (CNT) also support an OCAN route through East Central University in Ada, which has been a community anchor institution since OCAN launched in 2013. OCAN connectivity benefits both anchor institutions and their surrounding communities, particularly in rural areas. Michael Martin, chief information officer at Carl Albert State College, has seen this happen in Poteau. Most funding for OCAN came by way of a $74 million grant from the National Telecommunications and Information Administration, along with a $19 million in-kind state grant. Several state agencies partnered together to develop the project. Each of these organizations had relied upon different telecommunications infrastructures, but OCAN bridged those networks to provide greater speed and efficiency for Oklahoma citizens and state agencies alike. Construction of the network finished in 2012, and OCAN came online in August 2013, with OneNet managing its operations. As Oklahoma looks forward to the next five years and beyond, OCAN will continue to serve community institutions statewide. OneNet Executive Director Von Royal says the network is an important platform for helping Oklahomans compete in the modern world. "In the future, we look forward to supporting rural Oklahoma by continuing to provide high-speed broadband services. It remains our goal to give people across the state every tool they need in today’s fast-paced digital landscape."